Atop the Mealy Mountains in Southern Labrador, you will be encompassed by a stunning lake which empties over the cliff creating a beautiful waterfall. At the top of the Mealy Mountains in Southern Labrador, you will find a pristine lake that overlooks a waterfall surrounded by the rocky landscape of this mountain range. Layers of rock make up the bottom of the lake and on the surface, the water proceeds to the cliff ledges for its descent down the Mealy Mountains. 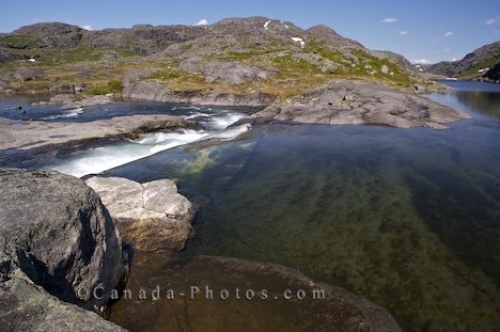 Lake at the top of a waterfall in the Mealy Mountains in Southern Labrador, Labrador, Newfoundland Labrador, Canada. Picture of a waterfall and a lake atop the Mealy Mountains amongst the beautiful rocky landscape of Southern Labrador.